Floor covering (‘Yolluk’ / Runner). Kilim. From the Konya region, 18th or early 19th century. Woven on a nomadic loom: two long symmetric strips, put together afterwards. The accurate accordance of the motifs of the upper and the lower half, indicates that the weaver was a skilled and experienced one. The design is inspired on a particular type of prayer rug, with seven or ten prayer niches that are piled up vertically. On this kilim the number of niches is ten; they are marked out by the white sections. The global design joins together a total of four prayer rugs, which are facing each other two by two. 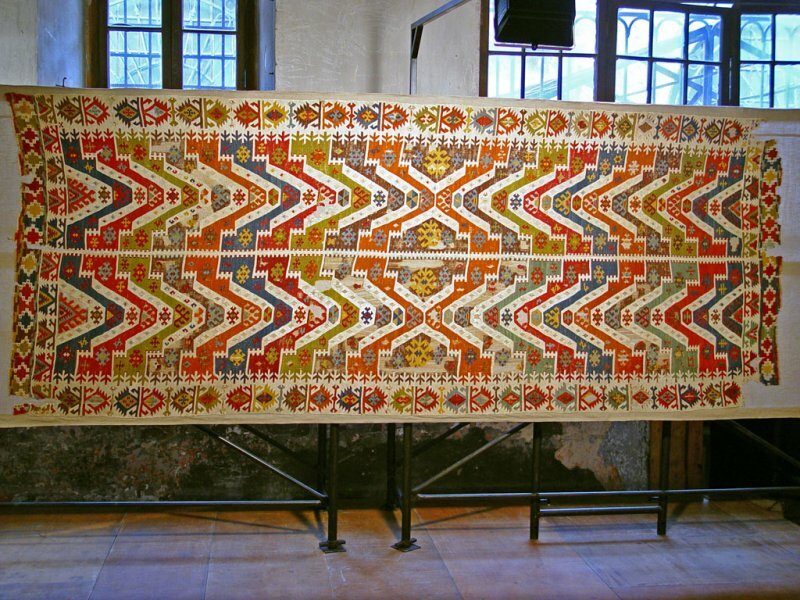 Source: ‘Kilim catalogue’ – Güran Erbek (DÖSÍM - Kültür Bakanlığı/Ministry of Culture .